Wednesday October 8th rushed in like the cool breeze that the morning brought with it. As the large capacity bus pulled up to section E in the GCC parking lot, everyone waited anxiously with their plethora of bags. Only one bag would be carried by the hotel’s bell service in New York City, but it was clear that everyone was willing to make the sacrifice of lugging multiple bags for the sake of fashion. Around seven hours, and a stop at Subway later, the fashion students of GCC had arrived in the heart of midtown Manhattan. 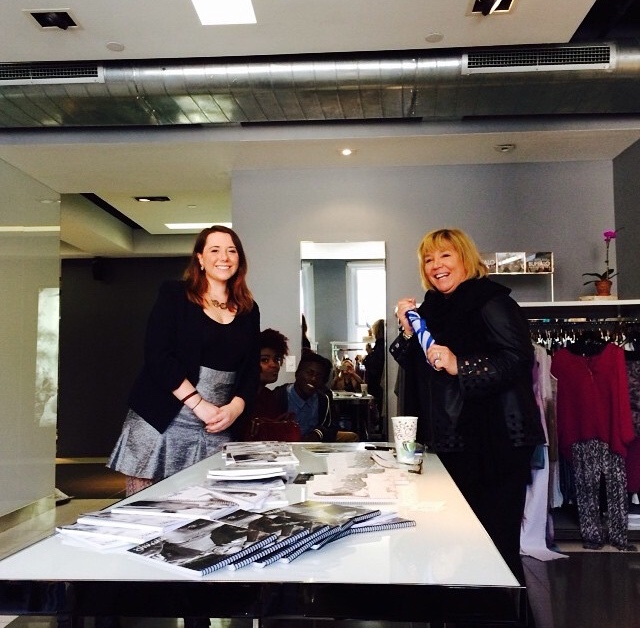 Christine Furmanek and Ami Cornell with the PR Director of Buffalo David Bitton, Diane Alexander. The very next day, we all trekked to the Buffalo David Bitton showrooms. This trip was one of the opportunities that I had been anticipating the most. I had hoped to take the opportunity to network with Diane Alexander, the PR Director of Buffalo, as well as visualize the direction of the upcoming Spring/Summer 2015 collection. Diane was one of the most entertaining presenters that I had the chance to meet all week. From her hilarious anecdotes about difficult celebrities, who shall go unnamed, to her candid persona, Diane certainly sells the Buffalo image. She shared with us the story of how one man by the name of Nik Wallenda, famed high wire artist, became one of Buffalo’s best brand representatives after stating that he wore Buffalo jeans while crossing the Grand Canyon on a high wire. 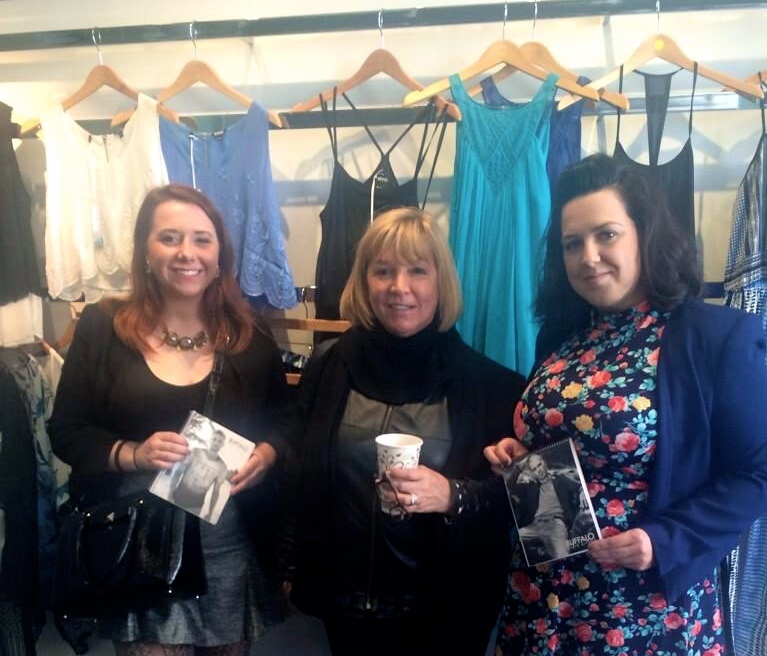 Diane clearly knows the fashion industry, and therefore has an endless amount of knowledge and stories to share. Christine Furmanek and I also had the opportunity to connect with Diane directly after she described her love of bloggers due to their easy-going nature. I served as the Project Manager for the trip, and was responsible for presenting Diane with a Genesee Community College branded umbrella, after which she had told us that she is obsessed with the umbrellas we bring her annually. Later in the presentation, students had the opportunity to ask Diane questions. When I asked her how she would describe the “Buffalo man or woman,” Diane responded by describing their target customer as an eighteen to twenty-four-year-old man or woman who is looking for a great fashion denim at a reasonable price. Diane pointed out that their male customers are steadfast and will often wear the same style of jean every year, making them repeat customers. Buffalo is certainly a brand that is on the move, they are constantly evolving and perfecting their image. Be on the lookout for their Summer 2015 collection, Buffalo will introduce fun prints, colors on the cooler end of the color spectrum, and styles that emulate boho vibes. After we finished our trip to Buffalo David Bitton showrooms, the fashion business students walked a few blocks south to The Doneger Group. 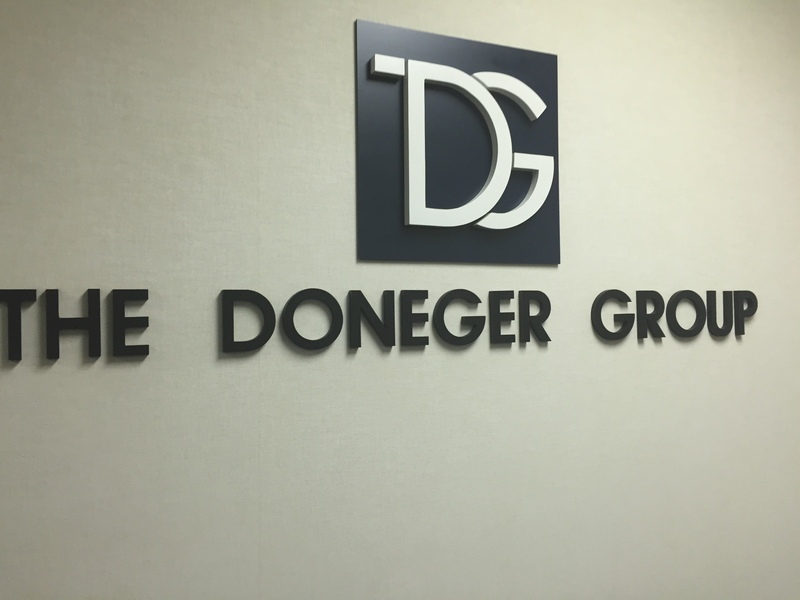 While at the Doneger Group we had the opportunity to meet Liz Lettieri, Trend Services Manager, and Michelle Rotbart, Trend Analyst. Liz’s job is to introduce products into the market and sell them, while Michelle develops all of the trend concept books for Doneger. At Doneger we were shown a variety of color and style forecasting reports that many major retailers within the U.S. pay thousands to see. The experience we had at Doneger was very interesting due to the fact that the depth of forecasting we were able to view was a side of the fashion industry that often goes unseen and unexplained. A major takeaway that I had from the Doneger Group experience was that color never changes completely, it evolves from season to season. When thought about in that light, it becomes easier to understand how different color palettes become within trend based on the season. 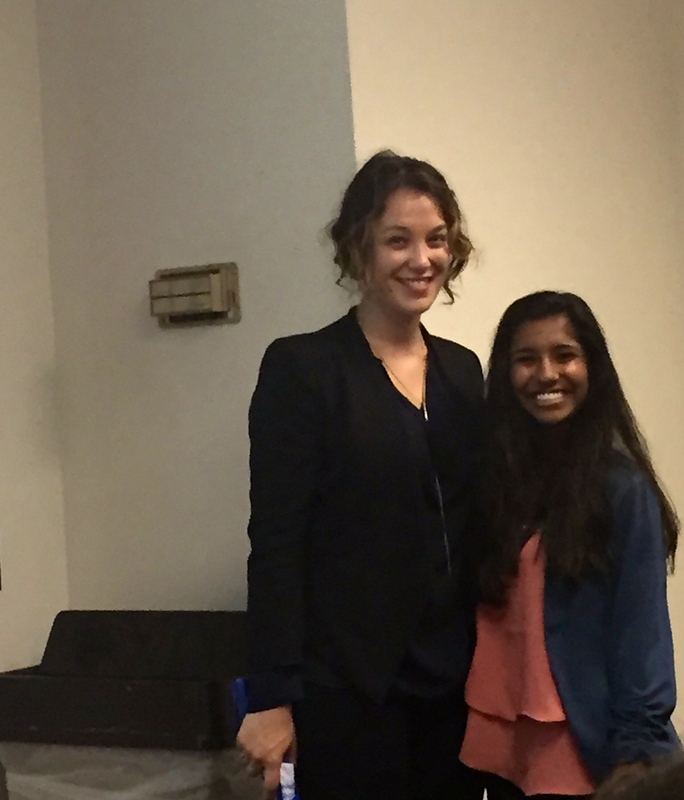 GCC student Lekha Anderson with Michelle of The Doneger Group. Michelle closed the presentation by stating that if you’re interested in trend, you should be interested in knowing everything, because trends encompass all aspects of life.Visiting Doneger was an unforgettable experience, and a rare one at that, I left the building wanting to know more. I feel fortunate to have had the opportunity to visit both Buffalo David Bitton and the Doneger Group. 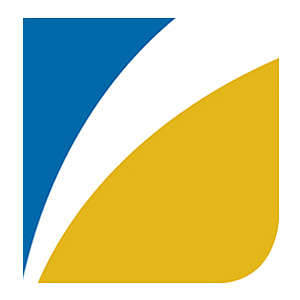 Opportunities like these do not come around often, but thanks to the excellent connections that we’ve all been presented with at Genesee Community College, this was all possible. Fashion is constantly on the move here at GCC so be on the lookout for there is more to come!